True to his word, Peter arrived at the hotel at 1000. He had a portable truing stand with him. We both agreed that the best thing to do was undo all the spokes and start again. That way we know they are all equally tensioned. An hour later, he had my wheel perfect. I was wrapped, to finally have it sorted out to a point where I felt confident that it would not let me down. As arranged, I gave him some money to pay for the Matatu trip back to the city. The guys and I then took a matatu through to Thika which is well known for its pork. We went back to the same eatery. The food was just s good. We bought some pots for Ben and Cal and they sorted out their Safaicom data bundles. Ben had a haircut and cal and I stopped at an internet cafe. Back at the hotel Joe, the manger asked us if we would like to meet his family. At about 1700 we wandered up into town, a walk was taken through the vege markets. These markets had so many fruits and veges and everything else beside. Thinking to myself, that most places back home lack these markets. There are so many rules and regulations that they are just not viable for those selling fruit. People in my country are for the most part resigned to buying their fruit and veges from Supermarkets who are only interested in fruit that presents well. Very much to the detriment of flavour. The best fruit and veges don’t present well, beauty is only skin deep. Some of the best oranges eaten have had greenish blotchy skins, the same goes for papaya. 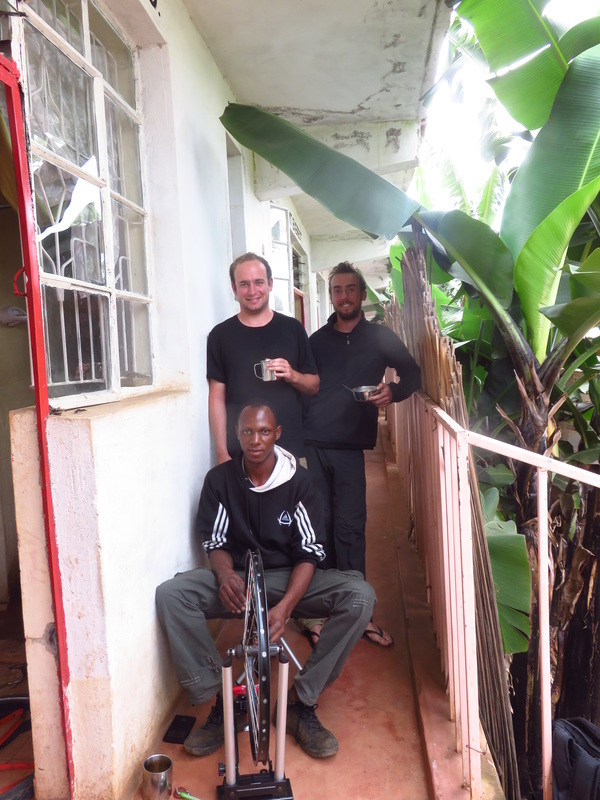 Over at Joes house we met his wife Helen and their daughter Blessed who had never seen a Mzungu before. She was fixated at our presence. We had chai and sat around and talked, they lived in a large block of small apartments with a court yard in the middle. It was great to be in the house of just an ordinary Kenyan family. Back at the hotel we had bread with avocado, onions, tomato and capsicum for dinner. Finally, on the road again, we got away about 0815, the road was narrow but all traffic was very courteous. Again much of the traffic was matatus. 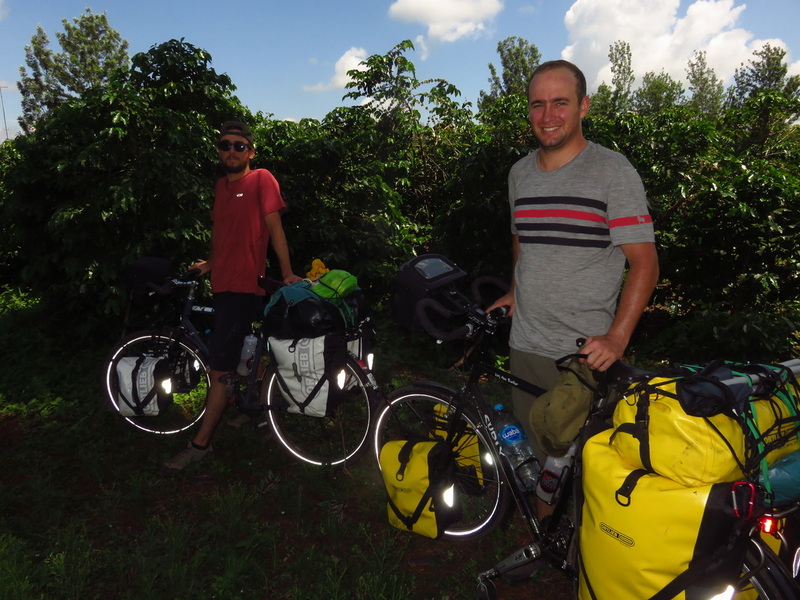 The country was lush and for the first 30km generally downhill. There ware coffee plantations and maize growing. The maize is for the dietary staple, Ugali. It was humid and the sweat was flowing readily. Ben was feeling it. This was his first real day of touring out of city traffic. I generally rode behind the guys. Until they are both road fit this will be my spot for most of the time. Crossing one fast flowing river, there were a crowd of people. Evidently someone had drowned here yesterday they had been looking for the body, it was recovered. We stopped for lunch in Kagio. Here I needed to borrow a spanner to undo my pedals which begin to make a noise after one thousand km or so. The thread into the crank gets dry from the pressure applied over time. Lunch was the normal,goat stew with greens and ugali with tea. By now Ben was getting very worn out. Much of the way was up small hills and back down again. In one valley rice was growing. We are nearing the equator and the nthn hemisphere again. Again the rain held off all day. 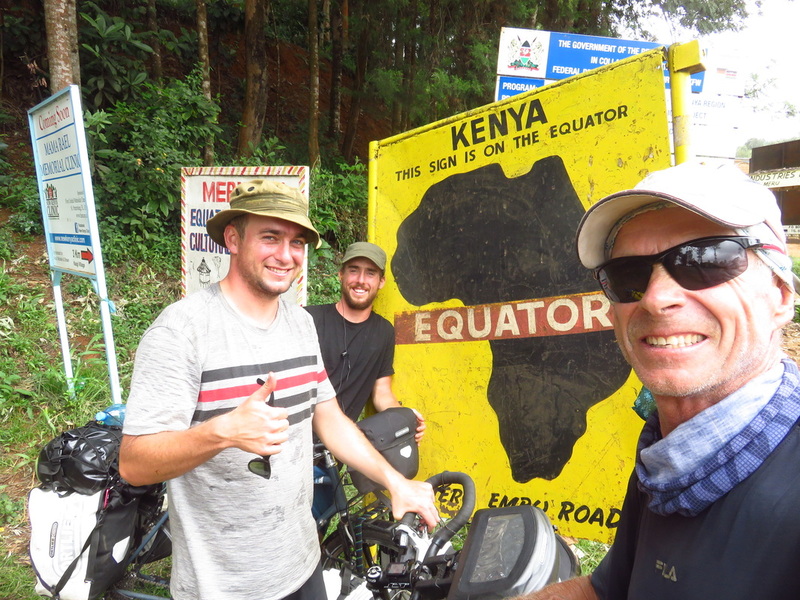 Nearing Embu, Ben was almost at the end of his tether, he kept going, without complaint. In a couple of weeks he will be fit as a fiddle. 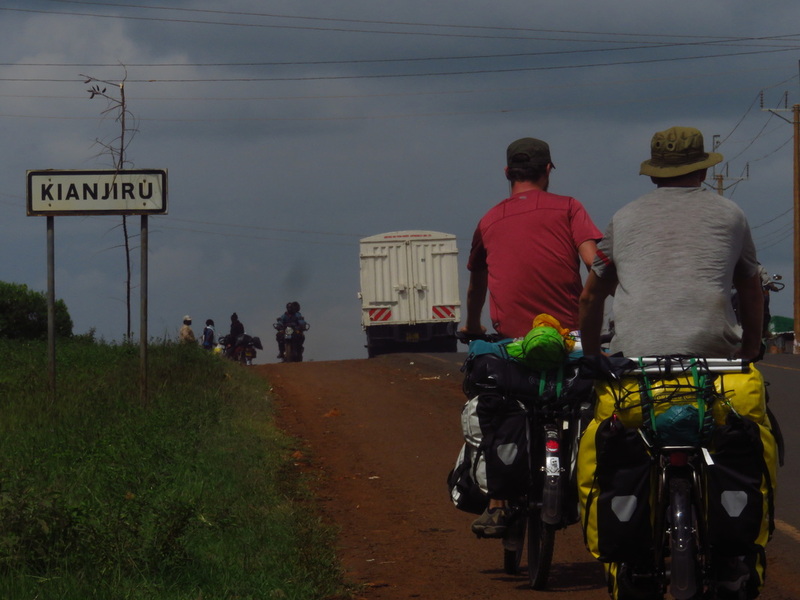 Once in Embu we pulled in for a coke and asked a lady where a guesthouse was, cheap of course. Right next door was the Tumaini Guesthouse. In here the lady said a room was 600 bob. I walked away she said we can talk. I tolde here this was not a 600 bob establishment. 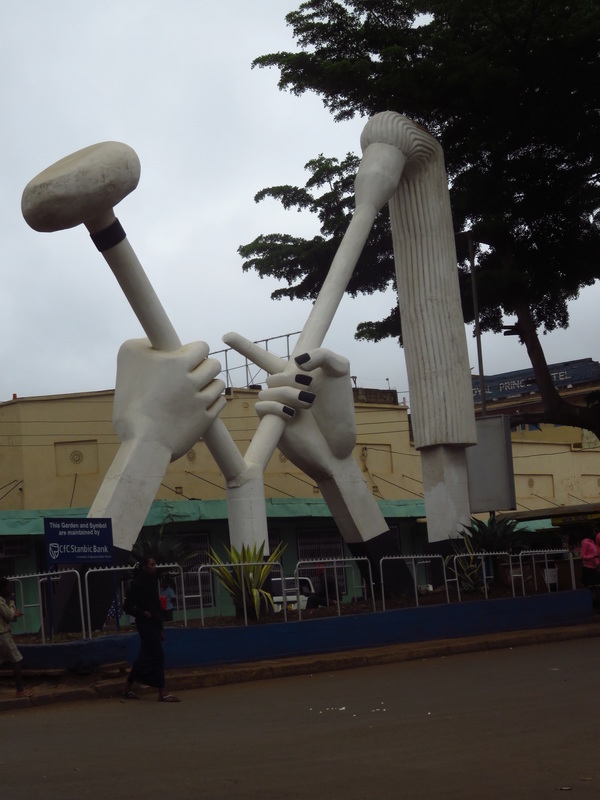 We came to an agreement of 400 bob. Booking 3 rooms has the advantage of bargaining poer. I recommend this nice clean, quiet lodging. Ben opened his door and fell asleep on the bed, cal was close behind in his room. Me, well I set about doing some washing . My new Hilleberg Soulo tent was erected and the guys were trimmed. I also needed to familiarise myself with it. Back at the hotel in Kelon, I had done the same with the mesh inner that came with the tent. Cal and I wandered into town for a reconnoiter. We found a good restaurant and bought yoghurt at the supermarket. Embo is a busy town on the road around Mt Kenya. We ate at the restaurant, same as usual though beef tonight with the usual. We were all in bed by 2030. It had rained early in the morning, things were still very wet when we arose. The evening temperature was perfect for sleeping. We are all getting better organized as a team now, with regards to cooking and eating. We were on the road by 0800. It was a steady climb from town. Near the top of the hill we stopped for Mendasi and chai. The rod was busy but again there was a good shoulder to use when we desired. There were speed humps here at certain locations, to stop people from undertaking. The shoulder had a layer of surface mud in many places. Cal had to stop to move his wheel guards a little further away from the wheels to stop the build up clogging the wheel. 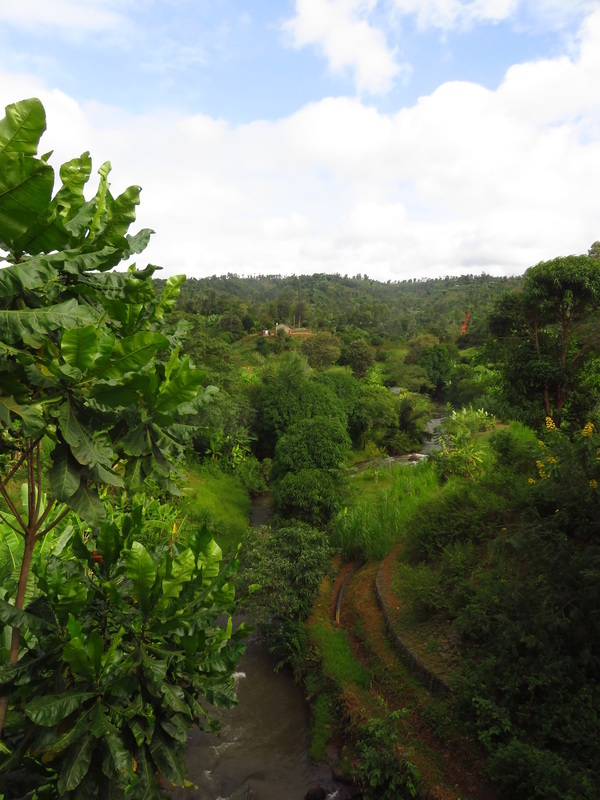 The surrounding countryside is extremely lush and tropical. 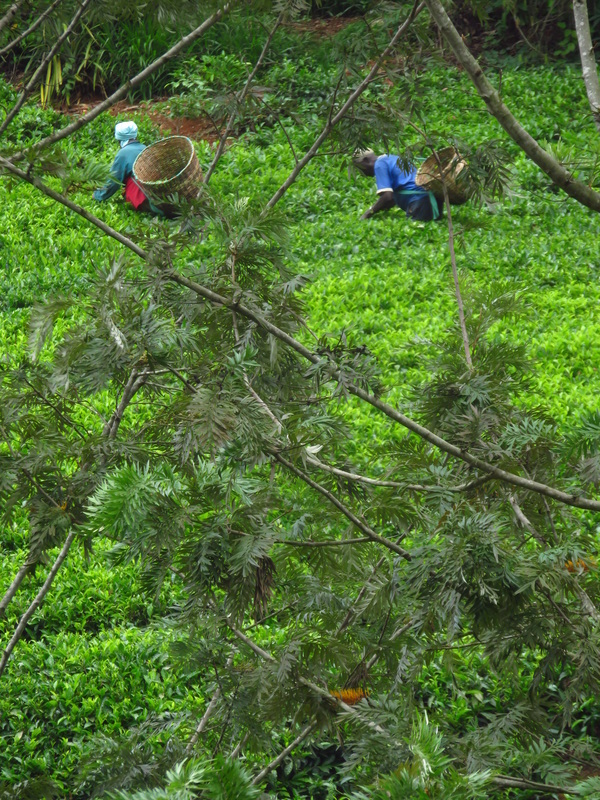 Tea was seen growing on the slopes.People were harvesting it just like the iconic labels on some brands. Where the people have a big basket over their shoulder, in which to place the young leaves harvested. It was a day of riding through small villages and greeting people everywhere. It was constantly up and down hill. With some very rapid ascents, as can be seen by today's max speed. These were always followed by an equal ascent. One huge descent, saw Ben having to push his bike for a couple of kilometres up the climb.. He is still getting road fit. We were in no hurry. In a small village we stopped for a great lunch off the main road. The rustic little eatery served a great meal of beef pieces, cabbage and Matoke, a very popular Ugandan dish made of plantain bananas and cassava. We added pepper to the dish just to spice it up a little. We soon got to Chuka. 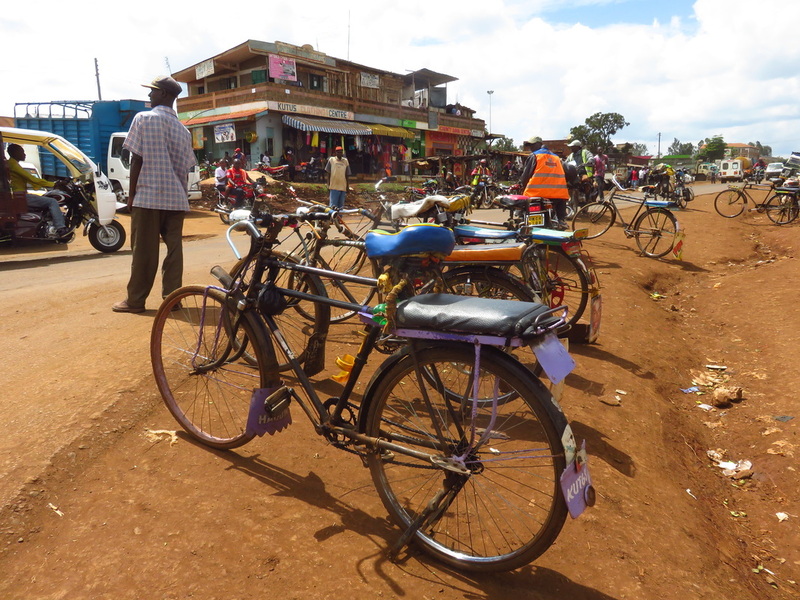 This was a crazy town people everywhere on the road mixed withMatatus and motos. My journey nearly came to an end here. A driver in a late model Hilux was speeding amongst people on the wrong side of the road. I swerved to miss a group of people and he was on the other side of them going at a wreckless speed for the conditions. It was so close, we both reacted immediately , he swerved like me, it was so scarily close. I was quite shaken. Right behind him was another Hilux doing the same thing. They obviously were travelling together. I told him to slow down in no uncertain terms and gestures of pushing my hand to the ground. We got followed by a bunch of kids through town trying to get money or food. We stopped at the top of a hill from here and bought, a papaya and bananas from a few stalls of very humprous woman who were looking for husbands. I was to old and the guys to young. They missed out! We were going to take the side road to avoid some traffic. These side roads that head west close to the park are not tarred. This for us is a big problem if there is rin. We decided to keep going. Getting to Kariana we decided to ask if there was a guest house there, the answer was no. However there was an upmarket place acroos the road. We went in and enquired, the price was up around 3500ksh for a room. Way out of our range. Anyway we asked if we could camp in their grounds. They were great and said we could camp there. The manager even offered us a free room. This was very kindly turned down. 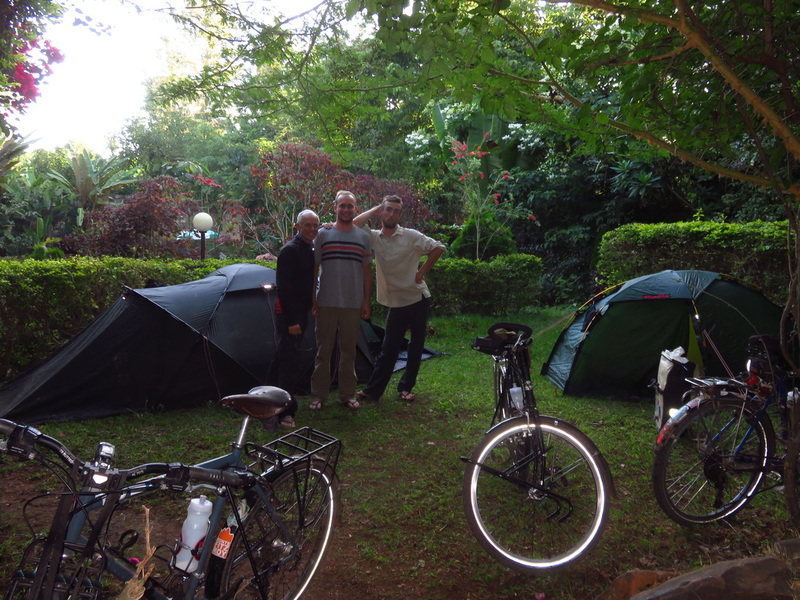 We were more thn pleased just to have a great campsite in the manicured gardens where they often had wedding receptions. It was the kind of place were on the day the county governor was having a meeting with people. There was even a little shelter by the spot we chose. It was a great place to get used to our tents. My Hilleberg Soulo is all new to me. It is very roomy for a one man tent with a vestibule that can take all my gear with one pannier inside the inner tent. Cal is familiar with the Tarra, we both used this in Patagonia. It is perfect for he and Ben. It too will take will shelter their gear under the two end vestibules. Hilleberg have tent making down to a fine art. Having payed attention to every little detail which has resulted in tents that can handle all types of weather. Importantly as an occupant it is great to know it can rain and blow all it likes and I will be safe and dry inside. Of course the choice of site plays a big role here. It’s no good in a watercourse that heavy rains create. We had great pasta with lotsof garlic and onion with soya meat. It tasted almost like chicken and filled us in a similar manner to the real thing . It is cheap and very light to carry. The rain held off all day and into the early evening. We have been extremely lucky in this respect. Mosquitos have been almost non existent here tonight which is great. We are 0’15”0 S at 1550m altitude, it is mild but not to warm. 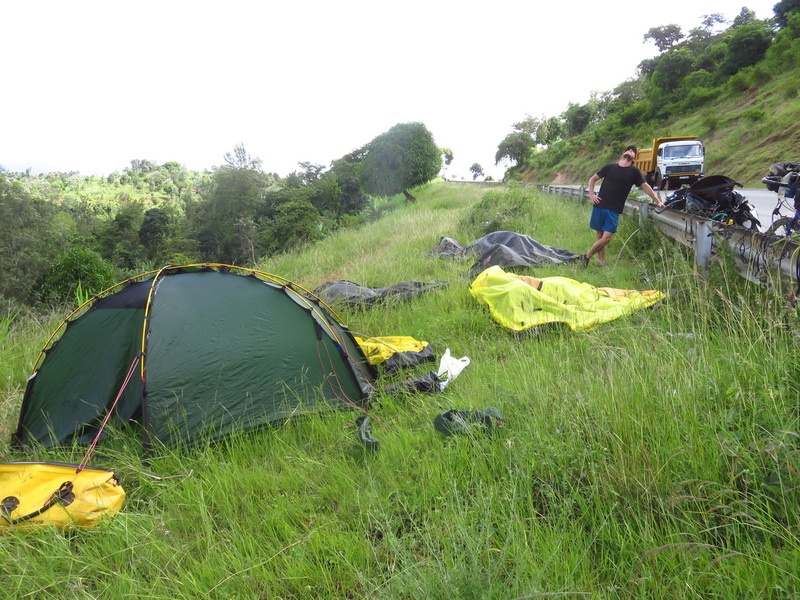 House work on the way to Meru after a wet night in the hotel grounds. Tea harvesting with an Aussie Silky Oak (Grevillea robusta) in the for ground. Peter came from Nairobi to get the wheel right. Thanks again Peter.